Portelance, D.J., Strawhacker, A., & Bers, M.U. (2015). Constructing the ScratchJr programming language in the early childhood classroom. International Journal of Technology and Design Education. pp. 1-16. Online First. Strawhacker, A. L., & Bers, M. U. (2015). "I want my robot to look for food": Comparing children's programming comprehension using tangible, graphical, and hybrid user interfaces. International Journal of Technology and Design Education, 25(3). pp. 293-319. Sullivan, A., Elkin, M., & Bers, M. U. (2015). 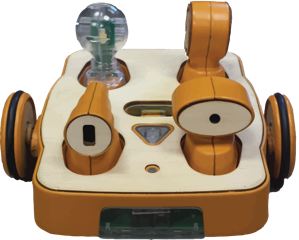 KIBO Robot Demo: Engaging young children in programming and engineering. In Proceedings of the 14th International Conference on Interaction Design and Children (IDC '15). ACM, Boston, MA, USA. Sullivan, A., & Bers, M.U. (2015). Robotics in the early childhood classroom: Learning outcomes from an 8-week robotics curriculum in pre-kindergarten through second grade. International Journal of Technology and Design Education. Online First. Bers, M.U., Flannery, L.P., Kazakoff, E.R, & Sullivan, A. (2014 - in press) Computational thinking and tinkering: Exploration of an early childhood robotics curriculum, 72, 145-157. Flannery, L. P. & Bers, M. U. (2013). Let's Dance the "Robot Hokey-Pokey! ": Children's programming approaches and achievement throughout early cognitive development. Journal of Research on Technology in Education, 46(1), 81-101. Strawhacker, A. Sullivan, A. & Bers, M.U. (2013). TUI, GUI, HUI: Is a bimodal interface truly worth the sum of its parts?. In Proceedings of the 12th International Conference on Interaction Design and Children (IDC '13). ACM, New York, NY, USA, 309-312. Kazakoff, E., Sullivan, A., & Bers, M. (2013). The effect of a classroom-based intensive robotics and programming workshop on sequencing ability in early childhood. Early Childhood Education Journal, 41(4), 245-255. doi:10.1007/s10643-012-0554-5. Sullivan, A., & Bers, M. U. (in press - Online First.). Gender differences in kindergarteners' robotics and programming achievement. International Journal of Technology and Design Education. Flannery, L. & Bers, M.U. (2012). Piaget and Programming Robots: Cognitive Developmental Level as a Predictor of Programming Achievement. Talk presented at EETC, 14 - 16 March 2012, Salt Lake City, Utah. Shaer, O., Bers, M., & Chang, M., (2011) Making the Invisible Tangible: Learning Biological Engineering in Kindergarten. ACM CHI 2011 Workshop on User Interface Technology and Educational Pedagogy, ACM: CHI 2011. Kazakoff, E.R., & Bers, M.U. (2011). The Impact of Computer Programming on Sequencing Ability in Early Childhood. Paper presented at American Educational Research Association Conference(AERA), 8 - 12 April, 2011, Louisiana: New Orleans. Kazakoff, E.R., & Bers, M.U. (2011). Kindergarten Robotics: Understanding and Programming Robots in Early Childhood, Poster presented at Society for Research in Child Development (SRCD) Annual Conference, 31 March - 2 April, 2011, Canada: Montreal. Kazakoff, E.R., & Flannery, L. (2011). Kindergarten Robotics Workshop to conducted at the Digital Media and Learning Conference, 2 - 5 March 2011, California: Los Angeles. Bers., M. (2010). When robots tell a story about culture...and children tell a story about learning. In N. Yelland, (Ed.) Contemporary Perspective on Early Childhood Education. pp. 227-247. Maidenhead, UK: Open University Press. Bers, M. (Accepted for publication). Parents and children: Engaging in positive technological development through robotics. Early Childhood Development and Care . Article accepted for upcoming special issue on Ecological Perspectives on Children's ICT Experiences. Horn, M., Bers, M., & Jacob, R. (2009). Tangible programming in education: A research approach. Presented at CHI'09, April 2009, Boston, MA. Bers, M. (2008). Blocks to Robots: Learning with Technology in the Early Childhood Classroom. Teachers College Press, NY, NY. Bers, M. (2007). Project InterActions: A multigenerational robotic learning environment. Journal of Science and Technology Education. 16(6 ), 537-552. Kahn, J & Bers, M (2005) An Examination of Early Elementary Student’s Approach to Engineering Proceedings of the 2005 American Society for Engineering Education Annual Conference and Exposition, American Society for Engineering Education. Beals, L. & Bers, M. (2006). Robotic Technologies: When Parents Put Their Learning Ahead of their Child’s. Journal of Interactive Learning Research. 17(4), 341-366. Portelance, D.J., & Bers, M.U. (2015). Code and Tell: Assessing young children's learning of computational thinking using peer video interviews with ScratchJr. In Proceedings of the 14th International Conference on Interaction Design and Children (IDC '15). ACM, Boston, MA, USA. Strawhacker, A., Lee, M., Caine, C., & Bers, M.U. (2015). ScratchJr Demo: A coding language for Kindergarten. In Proceedings of the 14th International Conference on Interaction Design and Children (IDC '15). ACM, Boston, MA, USA. Kazakoff, E.R., & Bers, M.U. (2014, April). Does learning to code correlate with self-regulation skills in kindergarten classrooms? Poster to be presented at the American Educational Research Association Annual Meeting, 3 - 7 April 2014, Philadelphia, Pennsylvania. Bers, M., & Cantrell, K. (Forthcoming May 2011). Virtual worlds for children with medical conditions: Experiences for promoting positive youth development. In A. Smedberg's E-Health Communities and Online Self Help Groups: Applications and Usage. Hauser, S.H.I ., Golberg, G., Wilde, P.E., Bers, M.U., Ioannone, L., & Economos, C.D. (2010) Comparison of Online and Face-to-Face Dissemination of a Theory-Based After School Nutrition and Physical Activity Training and Curriculum. Journal of Health and Communication, 15(8), 859 - 879. Beals, L. & Bers, M.U. (2009). A developmental lens for designing virtual worlds for children and youth. The International Journal of Learning and Media, 1(1), 51-65. Strawhacker, A., Portelance, D., Lee, M., & Bers, M.U. (2015). Designing Tools for Developing Minds: The role of child development in educational technology. In Proceedings of the 14th International Conference on Interaction Design and Children (IDC '15). ACM, Boston, MA, USA. Hilliard, L., Buckingham, M., Geldhof, G. J., Bers, M. B., & Lerner, R. (2015, March). Educational Game Play and Ethical Decision-Making: A Mixed-Method Experimental Study. Paper presented at the biennial meeting of the Society for Research in Child Development, Philadelphia, PA.
Bers, M. & Kazakoff, E. (in press - October 2012). Developmental Technologies: Technology and Human Development. In Lerner, R.M., Easterbrooks, M.A., Mistry, J., & Weiner, I.B. (Eds.) Handbook of Psychology, Developmental Psychology. Kazakoff, E.R.(2012). Defining digital literacy in early childhood. Paper presented at EETC, 14 - 16 March 2012, Salt Lake City, Utah. Beals, L.M. (2010). Content creation in virtual worlds to support adolescent identity development. New Directions for Youth Development, 128, 45 - 54. Bers, M.U. (2010). Beyond computer literacy: Supporting youth's positive development through technology. New Directions for Youth Development, 128, 13 - 23. Marina Umaschi Bers , Jared Matas & Nehama Libman (2013). Livnot U'Lehibanot, To Build and To Be Built: Making Robots in Kindergarten to Explore Jewish Identity. Diaspora, Indigenous, and Minority Education: Studies of Migration, Integration, Equity, and Cultural Survival, 7(3), 164-179. Bers, M. & Kazakoff, E. (in press). Developmental Technologies: Technology and Human Development. In Lerner, R.M., Easterbrooks, M.A., Mistry, J., & Weiner, I.B. (Eds.) Handbook of Psychology, Developmental Psychology. Bers, M. & Kazakoff, E.R. (in press). Techno-Tykes: Digital technologies and young children. In O.N. Saracho & B. Spodek (Eds.) Handbook of Research on the Education of Young Children. Bers, M. U. (2008). A Palace in Time: Supporting Children's Spiritual Development through New Technologies. In Youth, Development & Spirituality: From Theory to Research . (Eds) Richard Lerner, Robert Roeser, & Erin Phelps. Templeton Foundation Press: West Conshohocken, Pennsylvania.339-358. Bers, M. (1999) Zora: a Graphical Multi-user Environment to Share Stories about the Self. In Proceedings of Computer Support for Collaborative Learning (CSCL'99), pp. 33-40. Bers, M. & Best, M. (1999) Rural Connected Communities: A Project in Online Collaborative Journalism. In Proceedings of Computer Support for Collaborative Learning (CSCL'99), pp. 41-46. Bers, M. (1999) Narrative Construction Kits: Who am I? Who are you? What are we?. In Proceedings of Narrative Intelligence Fall Symposium, AAAI'99. pp. 44-51. Bers, M. &Urrea C. (1999) Con-science: Parents and Children Exploring Robotics and Values. In Proceedings of EUROLOGO'99, Sofia, Bulgaria, pp. 356-366. Bers, M & Bergman, S. (1998) A constructionist perspective on values: a response to postmodern fragmented identity. Identity, formation, dignity: The impacts of Artificial Intelligence upon Jewish and Christian Understandings of Personhood&quot;(4/ 30-5/2 1998)conference organized by The Boston Theological Institute, MIT AI Lab and Center for Faith and Science Exchange. Umaschi, M (1996) SAGE Storytellers: Learning about Identity, Language and Technology. Published in Proceedings of ICLS '96 , AACE, pp.526-531. Bers et al (1998) Interactive Storytelling Environments: Coping with Cardiac Illness at Boston's Children's Hospital (with Ackermann, E.; Cassell, J.; Donegan, B.; Gonzalez-Heydrich, J.; DeMaso, D.; Strohecker, C.; Lualdi, S.; Bromley, D.; Karlin, J. )In Proceedings of Computer-Human Interaction (CHI'98) ACM, pp. 603-609. Gonzalez-Heydrich J, Bromley D, Strohecker C, Marks J, DeMaso DR, Ackermann E, Gibson S, Shen C, Umaschi M. (1998) Experience journals: Using computers to share personal stories about illness and medical intervention.&quot; MedInf'98, 9th World Congress on Medical Informatics. IOS Press. 1998, pp. 1323-1327. Bers, M. (1998) A constructionist approach to values through on-line narrative tools. In Proceedings of International Conference for the Learning Sciences (ICLS'98), AACE, pp 49-55. Umaschi, M & Cassell, J (1997) Storytelling Systems: Constructing the Innerface of the Interface. Cognitive Technologies Procedings '97, IEEE, pp.98-108. Glos, J & Umaschi, M (1997) Once Upon an Object: Computationally-augmented Toys for Storytelling ICCIMA '97 Conference Proceedings; Gold Coast, Australia. pp. 245-249. Want to receive our project news automatically? Sign up for our e-list! 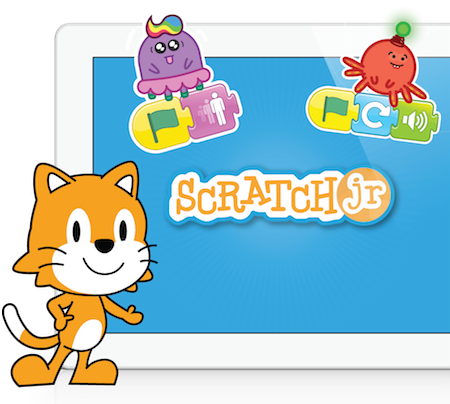 ScratchJr is now available for free download on iPad and Android tablets! Copyright © 2013 DevTech Research Group. CSS Design by jordan crouser.